This project attempts to establish a new relationship between humans and plants. 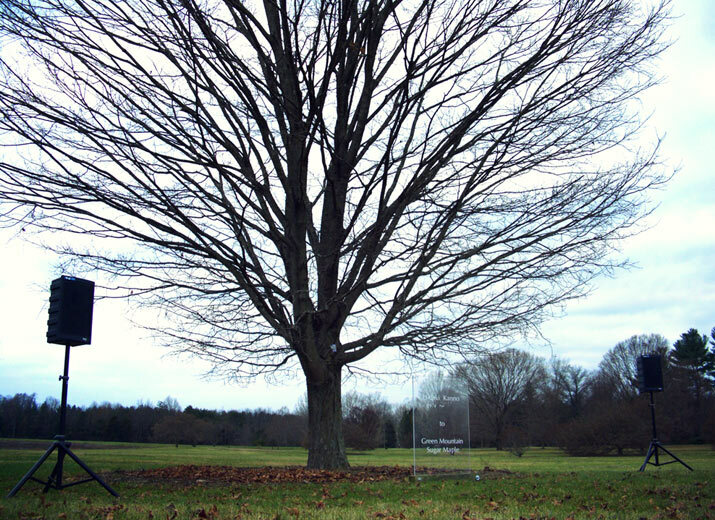 The installation was set up at the Bernheim Arboretum in Kentucky, United States. The project’s concept is that we can by showing our gratitude for receiving food and oxygen from plants by “returning” our body to them after we die. 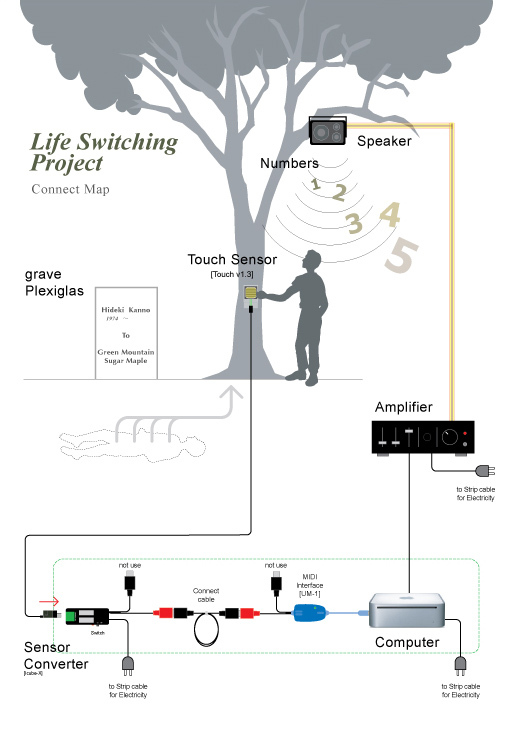 A person who agrees with this idea will be buried close to a tree, near the trunk, on which will be installed an interactive system with a touch sensor. 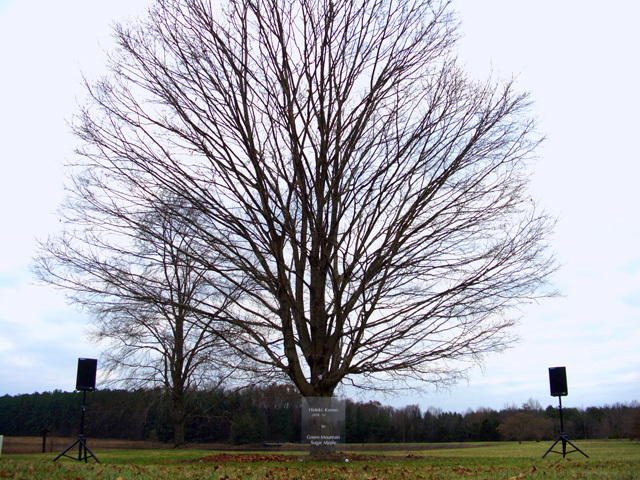 A computer program will count the number of times visitors touch the tree. 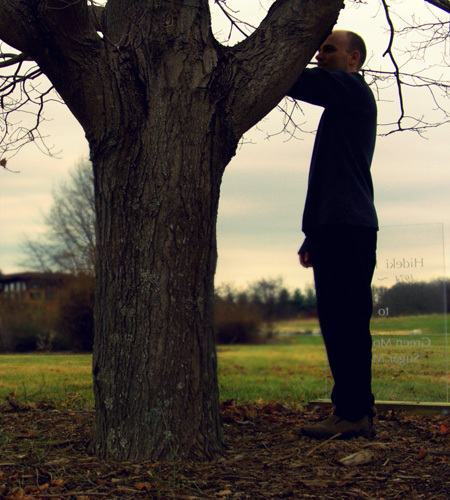 Each time a person touches the tree, the corresponding number will be called by a voice recording of the dead person, having been recorded beforehand. during this time they produce a lot of offsprings with fruits, nuts, and seeds. Most of these “offsprings” never grow up, but are eaten by other living things or rot without sprouting. It is like a contribution to the natural environment, a support of other living things. Plants are “giving” to others. But as humans, we must eat to live, so there is a difficult balance between man and plants. If we think about the possibilities of truly coexisting with nature, it seems we should consider a more fair relationship. When humans can become part of the process that gives back to the plants, perhaps it will be more balanced. When wild animals die, their bodies are returned to the natural environment by smaller organisms that help breaking them down into nutrients for the soil and plants. If humans would follow in the same manner, if we were to let our bodies return to nature, we would be helping the natural world and would provide nutrients for other living things. This project suggests that humans give their bodies to be used as nourishment for the trees. It is something like a donation to the earth. After someone dies they are buried near the tree without a coffin and the body could break down into the soil and nourish the tree. At that time, I propose that the body will switch to the tree body for taking in. 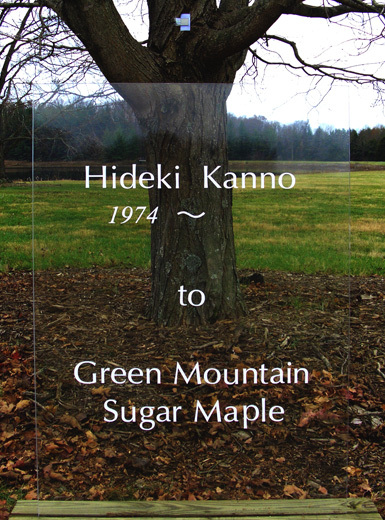 His life switches to the tree’s life and continues for a time longer than a human’s life. Changes are slow to occur in the nature environment. The time in the forest is quite long. It will take many years before changes impact the environment. If we can believe this switch body project, we would be able to change a life, reach out and have some positive affect on the inner forest for many years. We would be able to create a life instead of lash for the rat race. There is also the possibility that humans would overcome the fear of death. I would also hope that people would not want to cut these “switched” trees, so trees would increase in the forest. It would help balance the give and take of the environment. 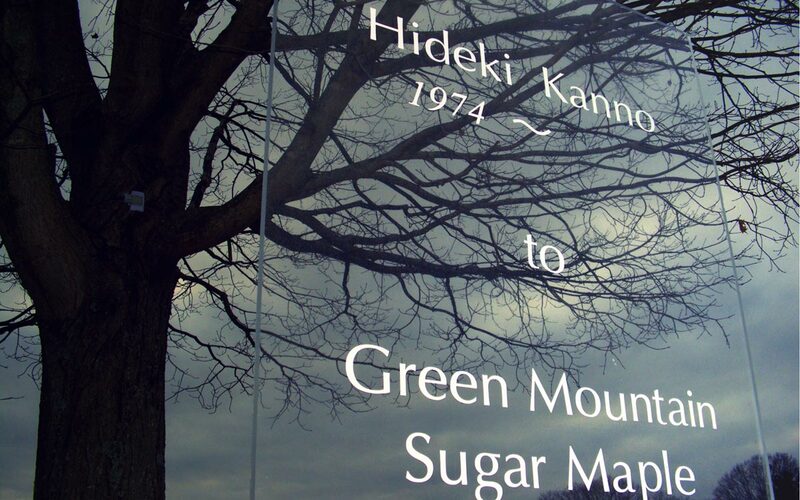 The switched tree would be visited by relatives and friends. They would enjoy meeting and speaking to them. When people like someone, they touch them like mothers hold their children, or like someone touches their lover’s hand. It is a way to express affection. 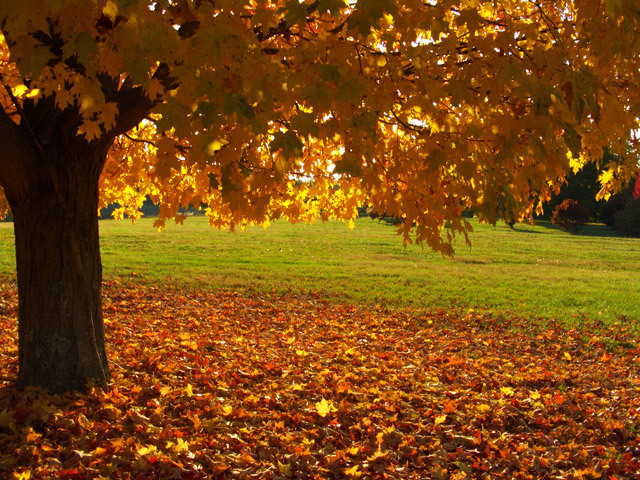 If someone would visit a switched tree and think of the passed person with affection, they would touch the tree. 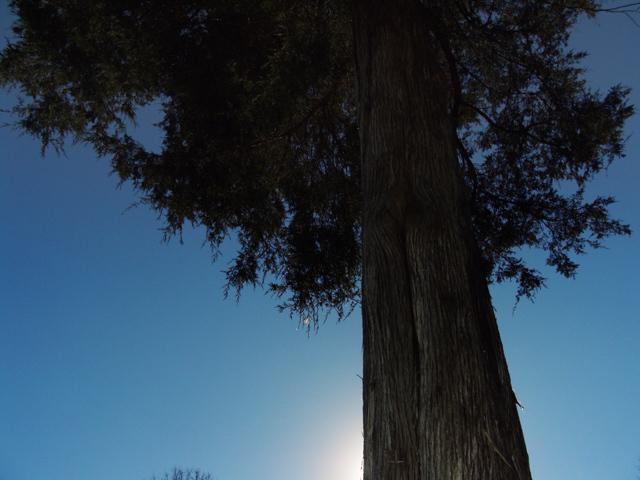 At the same time they touch the tree, they pass on their energy, and act of “giving” to the tree. I hope this act will be given freely without collateral, expressing thoughtfulness and caring for trees. I installed a sensor on the trunk of one tree. 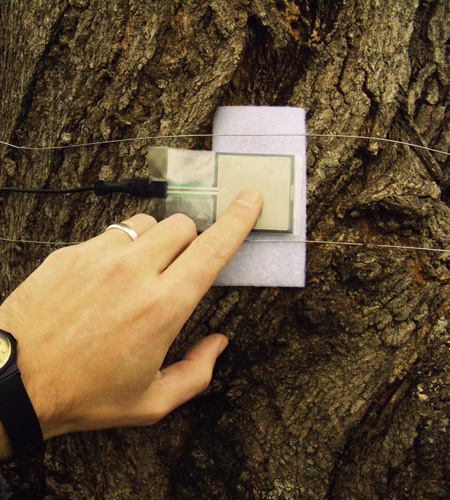 When someone touches the sensor on the tree trunk, the computer will read the quantity of touches. 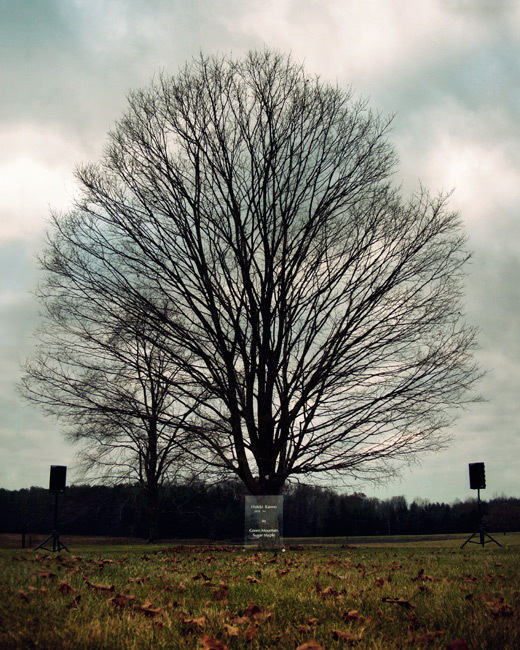 At the same time, the number corresponding to the touches will be read by the passed person who switched to the tree. 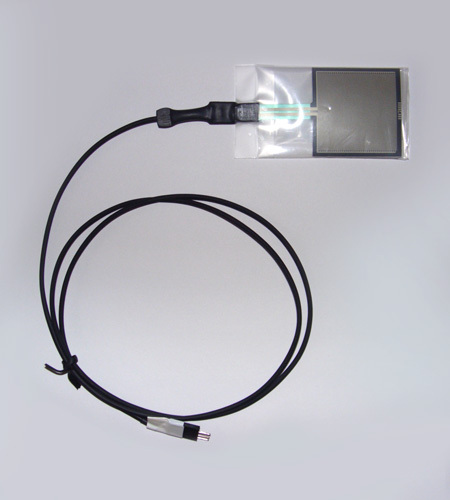 There will be amplifiers and speakers to play the recorded voice. It’s as if that tree will speak of the touches and the extent of the relationship intensity between humans and trees. I believe this quantity could be more valuable to the interacting person than amount of the money or property. Copyright © 2019 Hideki Kanno. All Rights Reserved.